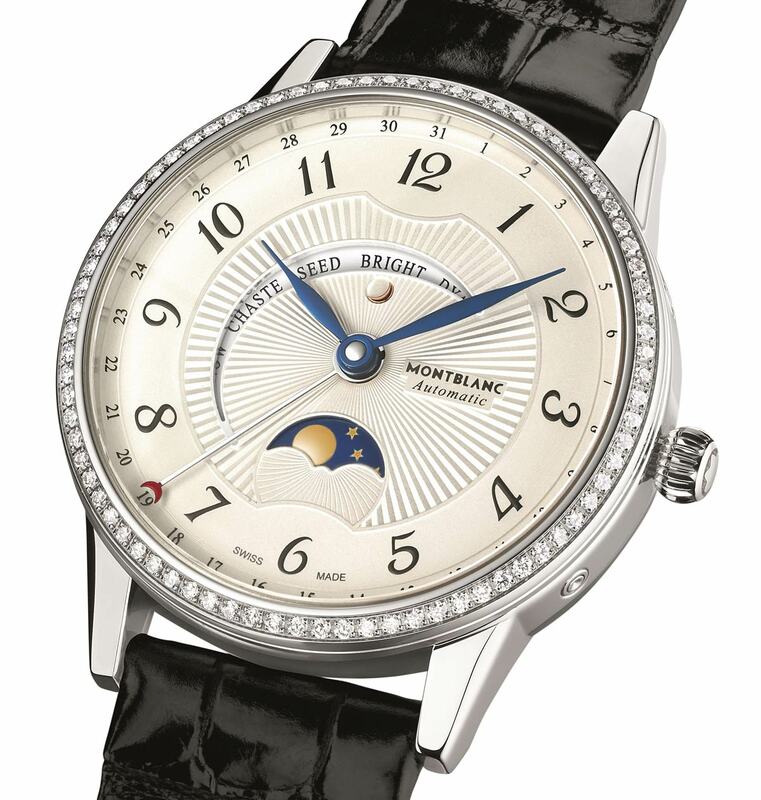 The latest Montblanc timepiece for Ladies adds a poetic yet useful complication to the typical styling elements of the Bohème collection like the elegant and classic case, the slightly curved faceted horns and the romantic dial with floral Arabic numerals. Developed at the watch manufacture in Villeret, the Maison’s Movement & Innovation Excellence Centre, the Bohème Moongarden was inspired by the romance associated with the moon and the different names that people gave to full moons over the lunar year. 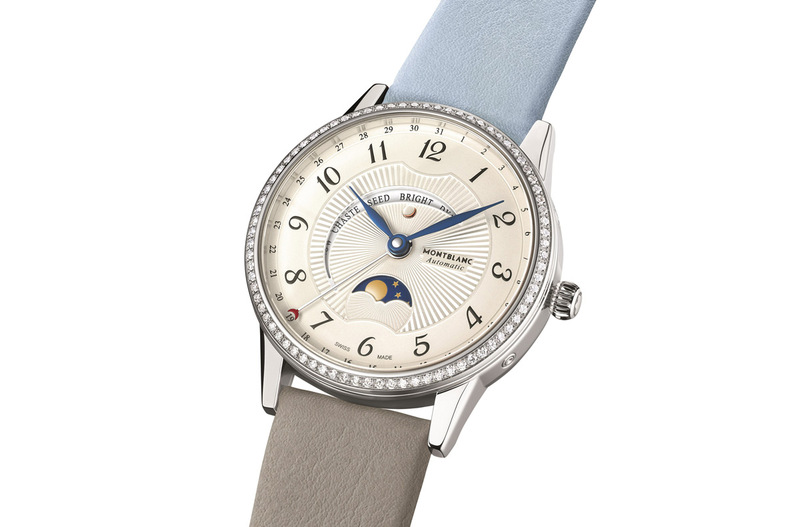 Introducing a new complication, the Moongarden displays the name of each month’s full moon instead of using the traditional name of the month. 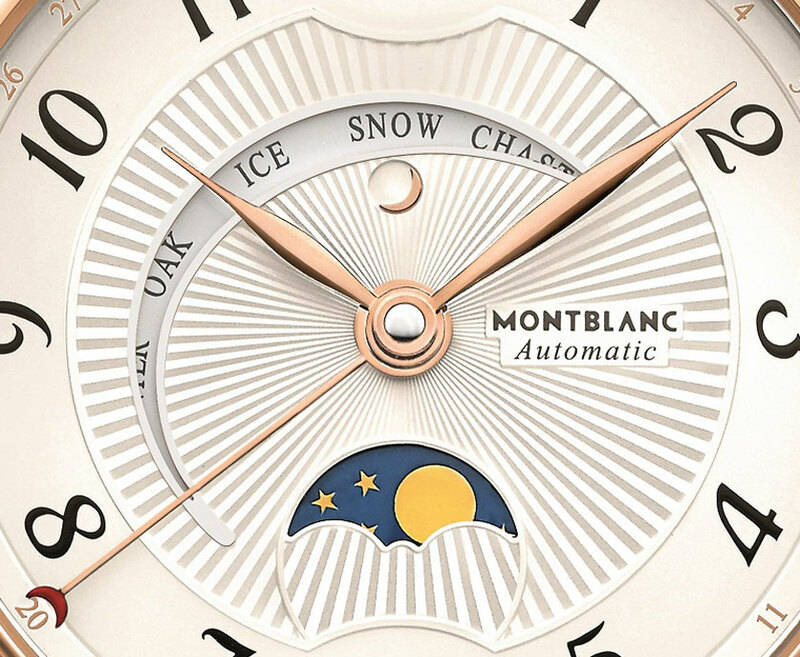 The name of each of the twelve moon phases (from January to December: Ice, Snow, Chaste, Seed, Bright, Dyan, Rose, Red, Fruit, Harvest, Hunter, Oak) are engraved in a circular fashion on the back of the watch to facilitate the setting and the choice of the moons. The current moon is the one in front of the little golden moon at 12 o’clock. 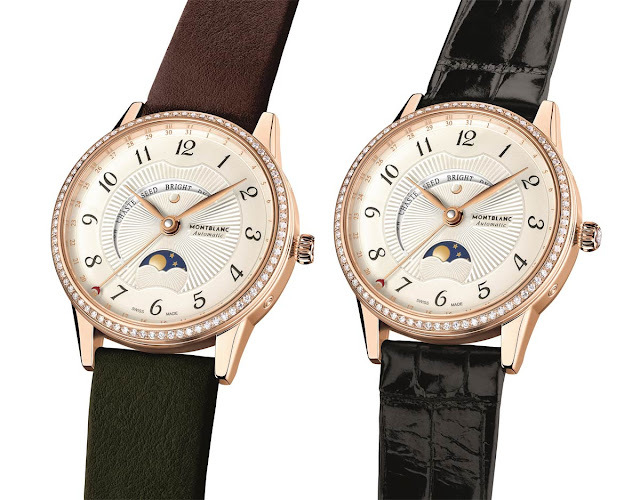 Below, at 6 o'clock, another aperture displays the moonphase which can be adjusted by using the individual corrector on the side of the 36 mm case. The floral Arabic numerals and the leaf-shaped hands are set on a silvery-white guilloché dial with 90 facets. The case is embellished with a crown set with a scintillating Montblanc diamond. A feature that will be highly appreciated, the Moongarden makes very easy to create a different look thanks to an interchangeable leather strap mechanism. 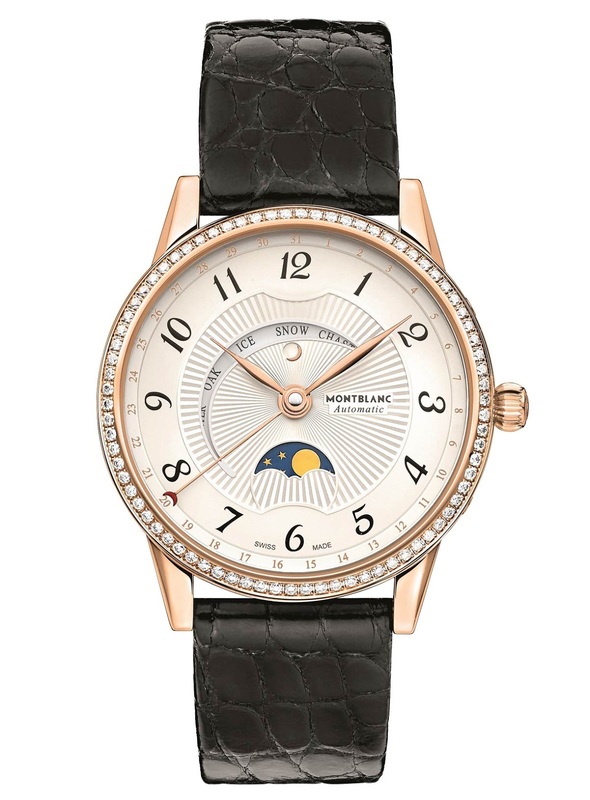 A simple push mechanism unlocks the strap allowing the wearer to pass from an elegant black alligator strap to a trendy two colour calf leather strap featuring seasonal colours to evoke the seasons and the changing of the moonphases. The movement of choice is the self-winding MB 29.17 with a manufacture complication. This 4 Hz (28,800 vibrations per hour) movement guarantees a power reserve of 42 hours. 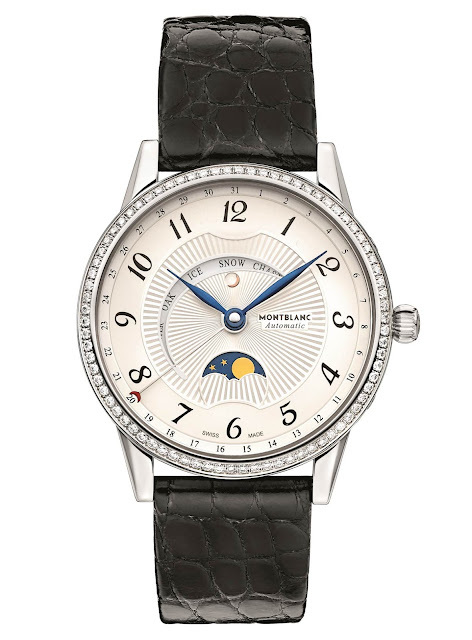 Montblanc Bohème Moongarden. Developed at the watch manufacture in Villeret, the Maison’s Movement & Innovation Excellence Centre, the Montblanc Bohème Moongarden was inspired by the romance associated with the moon and the different names that people gave to full moons over the lunar year. The Montblanc Bohème Moongarden is available in stainless steel (ref. 112555) or red gold (ref.112554) with prices starting at Euro 4,300 for the steel version.